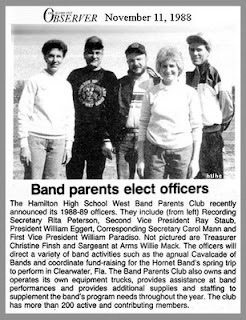 1989: THE HORNET BAND TAKES FLORIDA! 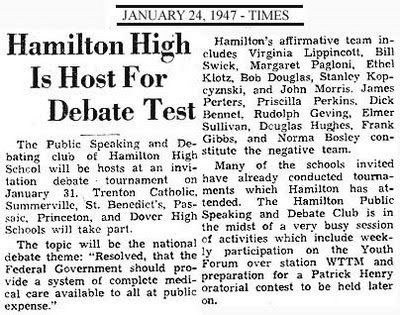 Excellence is, was, and probably always will be for the Hamilton High Hornet Band and Marching Unit. Here's a photo vignette showing the groups practicing for their participation in the "Sun 'n Fun" festival in Clearwater, Florida back in 1989. 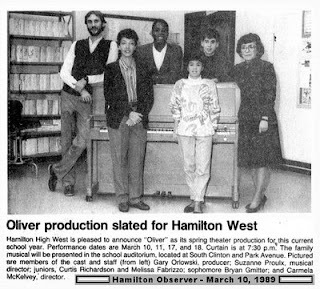 1989: HHS to Present "OLIVER"
When Louise Baird retired many years ago, I was afraid whomever replaced her in the vocal music department at HHS would never be able to achieve the level of musical excellence that was the hallmark of her long career. And then along came Ms. Sue Proulx! I have heard at least one of her groups over the past years and those fears were groundless. Sue has that same special "something" that results in incredibly beautiful choral presentations. At the Viet Nam memorial dedication last Veterans' Day, Sue's group actually had many of us in tears! Sue will go down in HHS history as one of the very best. 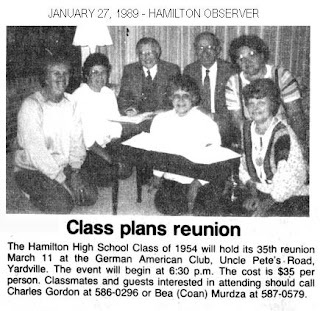 I received the email below from HHS '51 classmate Alice Schmidt Mullen who was a close friend of Peggy. I remember Peggy as a sweet girl with a very winning smile. She will be missed. Thank you for the heads up, Alice. 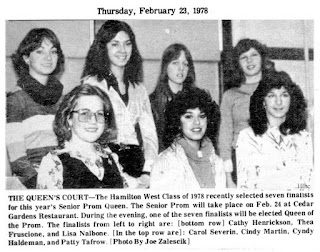 We just lost another classmate......Peggy Petry Oszvart. She was a very close friend. 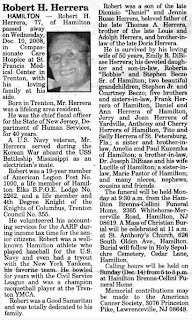 I saw it in today's obits and am very saddened by it. She was my buddy from before Reception Grade in Farmingdale School. We went all through school together and went to the same church. Our mothers used to take turns walking us to Farmingdale School every day. They did that until we went to on to the 4th grade in Greenwood School. She and I lived across the street from each other on Norway Ave. She was the one who took me to get my driver's license and asked me to be in her wedding party. Very sadly, we lost track of each other after I'd married and moved down here. Several times I looked for her by way of the computer but couldn't find her, so I thought that she'd probably moved away..........and there she was......still in Mercerville, all of this time. Margaret K. Oszvart TRENTON - Margaret "Peggy" Katherine Oszvart, 75, of Mercerville passed away Monday in Royal Health Gate Nursing and Rehab Center. 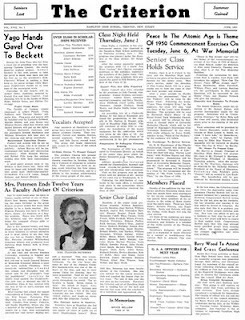 Born in Trenton, Mrs. Oszvart was a lifelong area resident and lifetime member of Bethel Lutheran Church of Trenton. 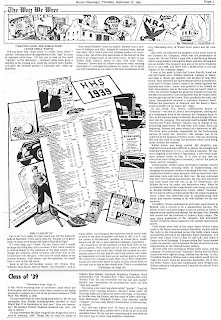 She graduated from the Helene Fuld School of Nursing, class of 1955, and was employed as a registered nurse at Helene Fuld Hospital and at the office of Dr. William Hipple in Trenton, from where she retired. 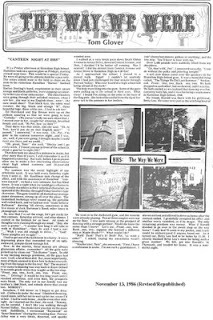 Predeceased by her parents, William and Margaret Petry, and her son-in-law, Daniel O'Brien, she is survived by her husband of 55 years, John Oszvart; two sons, John W. Oszvart and his wife, Joan, of Robbinsville and James S.; her daughter, J.A. O'Brien of Hamilton, and her grandchildren, Jason and Jessica Oszvart of Robbinsville. The funeral service will be held 10 a.m. Saturday from the Saul Memorial Home, 1740 Greenwood Ave., Trenton. Interment will follow in Greenwood Cemetery, Hamilton. Family and friends may call 9-10 a.m. Saturday at the Memorial Home, www.saulfuneral home. 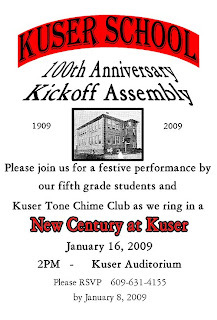 This announcement was received from Mr. Roberto Kesting, Principal of Kuser School, announcing the kickoff celebration for Kuser School's Centennial Celebration. Call the school if you plan on attending the program. 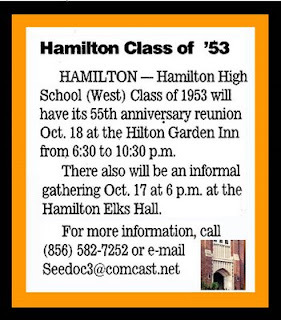 If you haven't already requested inclusion in the Kuser School alumni listing, call the school at the number on the graphic or email me at thomglo@verizon.net and I will forward your name and year graduated to the school. He was always ready with that cordial smile. 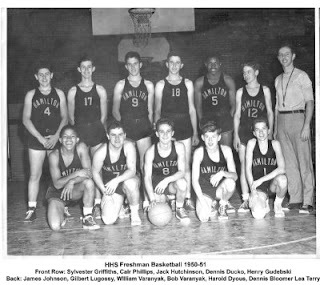 Bobby and I went through Hamilton High together and graduated in the class of 1951, or as I like to refer to it, "the class with class." Bob and I also attended St. Anthony Parish in Trenton and were regular summer visitors to the San Alfonso retreat house in West Long Branch. Bob and his lovely wife, Emily were always there for me when I was President of the St. Anthony Grammar School PTA. I remember Bob being a part of one of our PTA "Fathers' Night" fund raising programs, where Bob was in the "MIchael Rowed the Boat Ashore" segment of the program. 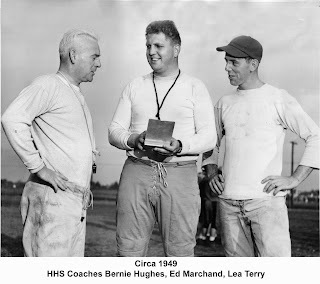 We met at our HHS reunions, and Bob was always there with his wife and that disarming cordial personality. I will miss you, Bob. You and Emily, Danny and Anne, whom I see frequently, and all the Herrera family will be in our prayers. May the Good Lord welcome you into his heavenly Kingdom. 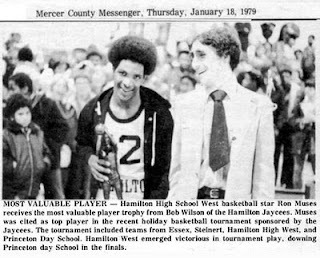 The photo of the handsome young gentleman from Hamilton's 1979 basketball team is shown proudly displaying his well-earned trophy. Assuming you were a senior at the time, Ron, you are now in your mid 40's. Thanks for making us Hornets proud! 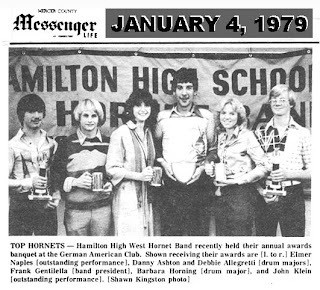 1979: There's That Hornet Band Again! Our high school music programs are incredibly effective! At the recent Veterans' Memorial dedication at Hamilton High School on Veterans' Day, Sue Proulx and her wonderfully talented choral group sang soul-stirring selections that had many of us in tears. 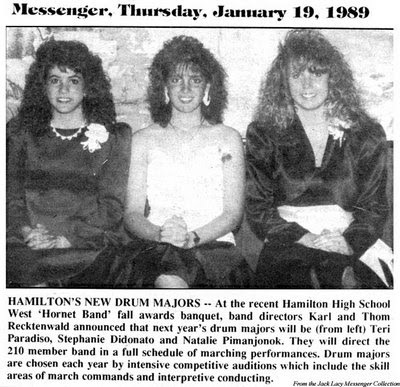 On the other side of the musical horizon, Hamilton's various high school bands are also award winners. 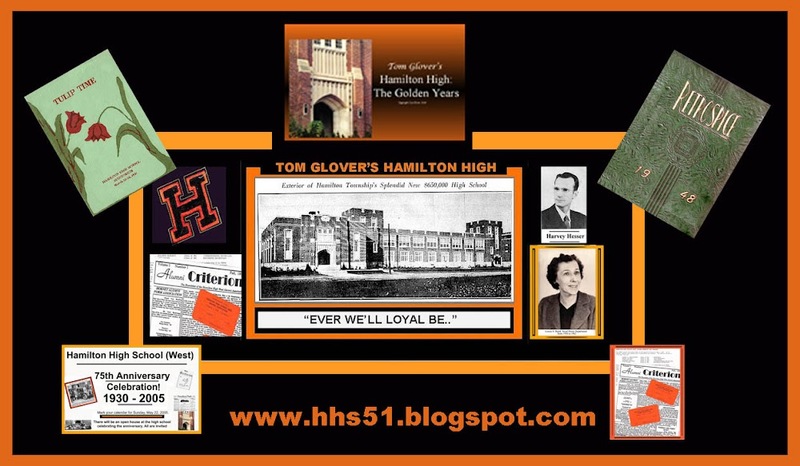 Of course, being an alumnis of the Orange and Black, I have a preference for the high school of my youth. 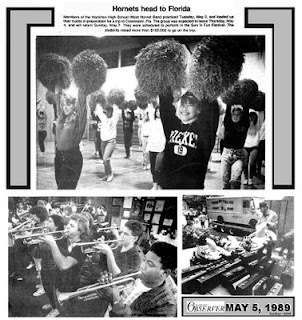 HOWEVER, a few years ago, I attended one of those "battle of the bands" which was held at Steinert. I wouldn't want to have been a judge. They were all incredibly talented and the music was superb. 1981: AUDIO MP3 OF MY 8 WEEK "KUSER SCHOOL DIARY"
Way back in 1981, before digital audio came to personal computing, I made an audio recording of my Mercer Messenger "Kuser School Diary" columns. 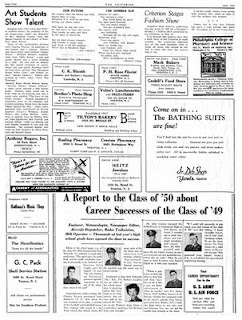 This particular series was published on 8 consecutive Thursdays. Please remember that this was recorded on a reel to reel MONAURAL (not stereo) tape recorder, and the quality is a click or two below marginal. With my audio-converting software, I was able to convert "Kuser School Diary" from analog to a digital "mp3" file. Below is the link to that file. WHEN YOU CLICK ON THE LINK BELOW, YOU WILL BE TAKEN TO THE HOSTING WEBSITE. 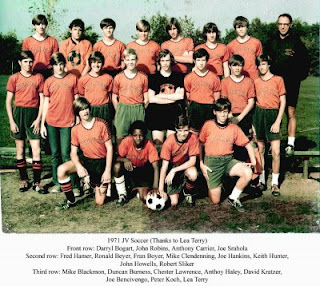 CLICK ON MY "KUSER SCHOOL MEMORIES" FILE AND DOWNLOAD IT. IT SHOULD LOAD AUTOMATICALLY INTO YOUR WINDOWS MEDIA PLAYER. PLEASE LET ME KNOW IF YOU WERE ABLE TO PLAY THE FILE PLUS ANY OTHER COMMENTS. YOUR ASSISTANCE WILL DETERMINE WHETHER OR NOT I POST FUTURE AUDIO FILES. What a great story! 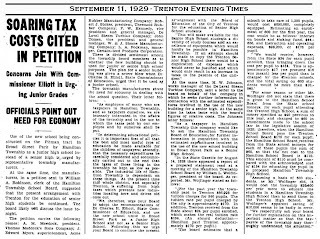 Imagine Trenton having a school with an excellent scholastic record. 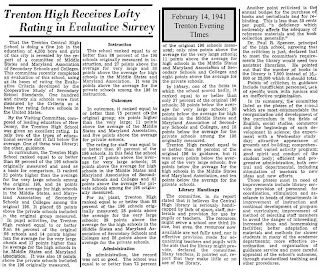 Thus it was at Trenton High and also in Trenton's Junior and grammar schools. Where did we go wrong? 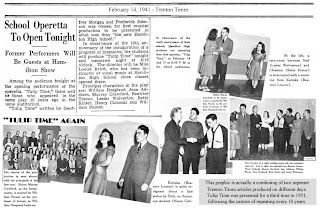 Tulip Time was the first operetta presented at Hamilton High in 1931. 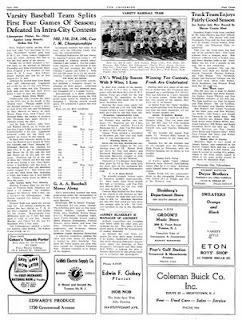 It was repeated again in 1941 as seen in the above graphic. 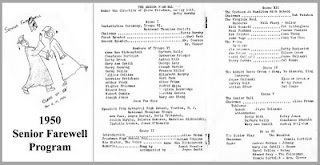 My class of 1951 also carried on the tradition and presented it as the 30th anniversary of the schools music-drama program. It would really be great had the school continued the custom right up to the present time. The quaint and innocent story line and lovely music would have brought an entertaining presentation to the audience. I just learned of her death and have been crying off and on for a few days. I have lost a great friend. 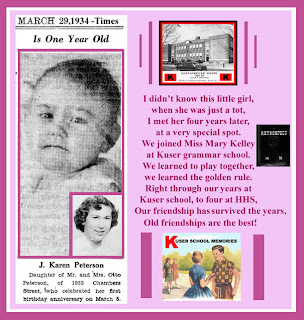 She was my neighbor and buddy through elementary schools (Rowan, Willey, Lalor), through Hamilton High School and beyond our 1954 graduation. We shared a love for fun and for the absurd. Janet was very intelligent with a well developed, albeit droll sense of humor. We survived fights in elementary school about, for example, whose legs were more bowed! Together and in groups, we went swimming, skiing, ice skating, to the “Feast” in Chambersburg, to parties, to dances and to the movies in downtown Trenton. We just hung out, grew up together and shared our secrets and our dreams for the future. Her mother Hilda, from Norway, was a skinny dynamo, who was always very well dressed and who fussed over Janet to a fault. She had a great sense of humor and taught me how to make fattigman, Norwegian cookies! I loved her as well! When they took a trip to Norway to visit relatives, they brought back lovely souvenirs for me. In high school, Janet was a good student. She was a three year Modern Dance Club member and a two year member of All State Orchestra. She played the violin. 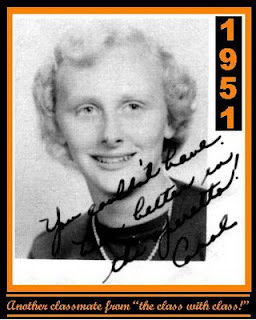 She was captain of the Orange Sports Team and was a three year member of the hockey and basketball teams. 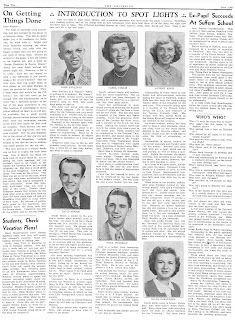 She was especially loved by me, Marilyn Block Lister and John Gibbs, also classmates of hers in 1954. 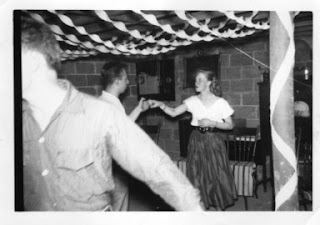 Our lives in the fifties were carefree, unsophisticated and truly “happy days”. Janet and Marilyn Block Lister were bridesmaids, when I was married in 1962. After we were all married and had children, we lost touch only to meet one more time at a bittersweet lunch, which included John Gibbs and Frank Giacobbi, when we celebrated our 50th year reunion. I never saw her again, even though we vowed to get together. The worst part of getting old is the increasing loss of beloved family and friends. These are people who shared your unique place in history. But how lucky I am to have known someone to whom it was so hard to say goodbye. “A friend hears the song in your heart and sings it to you when your memory fails” (anonymous author). 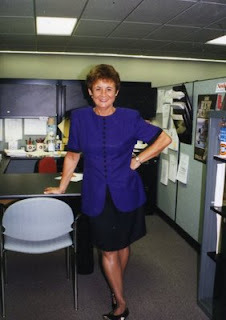 Rest in peace, my old friend, Janet, you are loved and will be missed by so many. OLD FRIENDS ARE THE BEST FRIENDS. 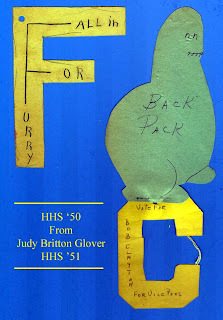 MARION GOLDENBERG SCHWARTZ, HHS '54 POSTS THIS TRIBUTE TO HER BEST FRIEND WHO RECENTLY PASSED AWAY. 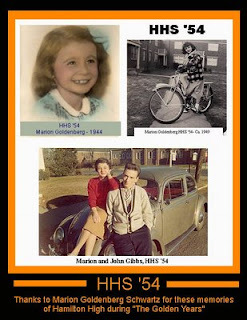 MARION GOLDENBERG AND JANET NILSON WERE INSEPERABLE COMPANIONS IN THEIR EARLY YEARS. 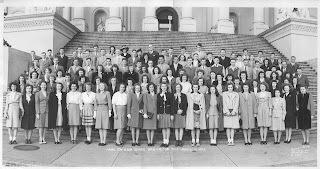 IN MY NUMEROUS EMAILS FROM MARION, IT BECAME OBVIOUS TO ME THAT SHE HARBORS VERY PRECIOUS AND BITTERSWEET MEMORIES OF THE HAPPY YEARS SHE SPENT WITH JANET NILSEN FROM THE CLASS OF '54. JANET PASSED AWAY RECENTLY. YOU MUST CARRY IT WITH YOU OR YOU FIND IT NOT." 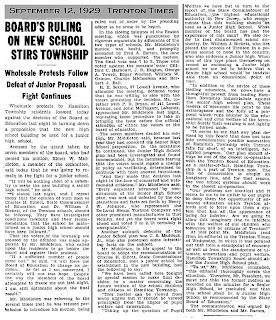 I have received an email from Kuser Principal Roberto Kesting announcing the first formal meeting of the Kuser School Centennial Celebration. 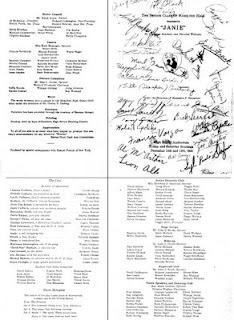 I know there are some visitors to this site who are "Kuser Kats" and have expressed an interest in being kept informed as to the activities surrounding the planning for this memorable and historic celebration. If you are interested in being kept informed, or are interested in attending as an alumnus (as I am), contact either Mr. Kesting at the address below, or email me. TRENTON HIGH SCHOOL, AND THE MONEY ALLOCATED FOR THE HIGH SCHOOL SHOULD BE CHANNELLED TO A JUNIOR HIGH SCHOOL. I HAVE POSTED THIS ON MY MAIN WEBSITE, WWW.GLOVER320.BLOGSPOT.COM, AND ALSO ON THIS SITE. 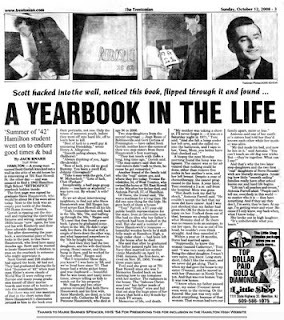 FIFTY FIVE YEARS! WHERE HAS THE TIME GONE? 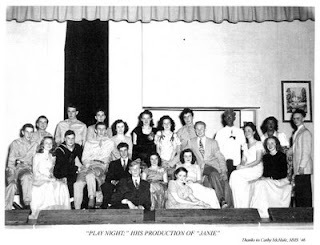 1946: HHS ANNUAL DRAMA PRODUCTION OF "JANIE"
HERE ARE THE GRAPHICS CATHY McHALE, HHS '46 SENT TO THE LIBRARY FOR OUR EXTENSIVE HAMILTON HIGH WEST DIGITAL DATABASE. 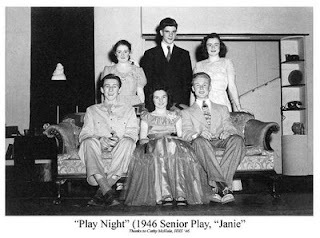 "JANIE" WAS THE DRAMA PRODUCTION OF THE YEAR 1946. 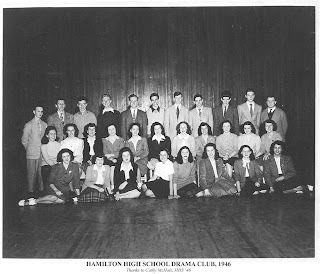 EACH YEAR, HAMILTON HIGH PRESENTED AN ON STAGE PRODUCTION.